Every few decades, that dreaded abomination, the Tarrasque, reawakens from its long slumber. At such a time, the world's greatest heroes must defend the world from its nigh-insatiable appetite. Sometimes these heroes fail, and civilizations fall. And even when they succeed, the lands in the Tarrasque's wake are changed forever. The heroes had one more day to spend in Zahallan before Midorichal's caravan departed. Fatou met a wizard who worked as a scribe at the Temple of the Moon who was willing to copy a few spells from his spellbook for the usual fees. Edel sought news of his homeland and heard of the Virren family, an sorcerer and his bowyer daughter, who came from Fendorlis. He learned how to find them, and will do so when he returns to town after this job. Two days later, ZhaZha spotted vultures circling a short distance from the caravan's path, so she and some of the other PCs veered off to check it out. Once they reached the crest of a nearby dune, they could see what had attracted the carrion birds: the corpses of three giant-sized humanoids. An immense vulture, nearly the size of a horse, fed on the largest of these bodies, while a small flock of normal vultures pecked over the other two, giving the larger bird a wide berth. The PCs were curious about the bodies, so decided to shoot the large vulture to try to drive it off. That merely made it angry, and it took to the air to retaliate. ZhaZha charged forward on her camel and dealt the vulture a strong thrust with her lance. It failed to stay airborne, and Jubair and Jumari leaped forward to flank it. Lucretia and Edel, who had stayed with the caravan, saw the vulture once it attacked, and both ran to help. By the time they arrived, the bird was badly hurt enough to try to flee. but could not evade ZhaZha and Jumari's attacks and crashed to the ground dead. Jumari examined the body, and warned the others not to touch or eat its flesh, as it was obviously infected with some sort of disease. The party was very lucky to have avoided taking any damage from its massive hooked beak! Many of the party did, however, take some feathers as trophies--the pinion feathers were as long as a sword--but Edel was sure to use his cantrips to thoroughly clean them first. Jubair promptly gave the great beast a name and posthumous title: "Featherclaw, Terror of the Sands." 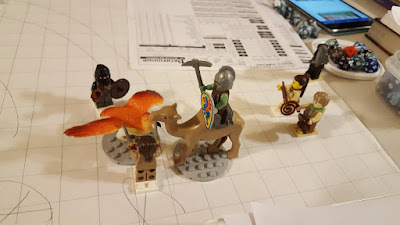 Jumari, Jubair, ZhaZha (mounted), Lucretia, Edel, and Fatou vs. the giant vulture. They were then free to examine the other bodies with no interference from the other vultures. The two smaller giants were about 9 feet tall, and had skulls with a single eye socket (now empty, thanks to scavengers). Both wore the remains of crude hide armor, but any valuables had already been taken. The larger giant was about 15 tall and more slender, dressed in full desert robes and keffiyeh, with a notched greataxe lodged deep in its side. In life, this giant would have looked like any human native of this region except for size. Nearby were two scimitars, once very fine but one had a broken blade; they took these, hoping to sell them later as curios. The party found a pouch tucked deep inside the larger giant's robes, which held a number of coins and a large sandstone disk. This object was carved with a ring of four circles around a fifth, central one, with some foreign script around the edge and on the back. None of them recognized the language, but guessed that it was Giant. Fatou identified the design as a version of a holy symbol of the Gods of Meda, a pantheon of elemental gods very rarely worshiped in this part of the world. Once Lucretia heard this, she added that the Medan gods are popular in the Sword Islands, far to the northwest of here; most giants that she knew anything about were from there or even farther north, so she was very surprised to find any here. Having learned all they could, the PCs returned to the caravan and reported the fight with the vulture and the scimitars they had found. 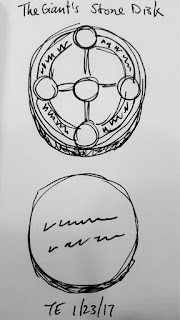 They decided not to tell Midorichal about the giants' bodies or the stone disk, preferring to keep that mystery to themselves to puzzle over later. They reached the Burburan Oasis the next day. The human and halfling nomad tribes of the Lokoran Desert had founded a semi-permanent town here to guard the water, provide a trading post, and cater to the needs of travelers. Midorichal had made arrangements to meet with the local halfling sheik, Hafiz Barakat, to do some business. That evening, after the caravan was settled, Edel found a crowd to perform for, presenting his latest tale: the comic story of Jubair and the pesky scorpion that took an entire party of adventurers to squash. Meanwhile, the rogue challenged his companions to see who could find a speaker of Giant first. Jumari was the most successful there, hearing of a halfling scholar, Sulma Malak, who worked with a group of treasure-hunters led by Allara Fawk. She learned where to find their favorite drinking establishment. She was told there that "Allara's Diggers" were not in town, but were expected back within a few days. The next morning, the PCs escorted Midorichal to his meeting with the sheik, which was quite long but seemed to leave both men feeling very pleased with the result. After seeing their boss back to camp, the PCs were free to explore the town. They split into pairs to do this, having a number of tasks to accomplish. Jubair and Edel took the large scimitars to a weapons dealer who recognized them as giantish work (and not just because of their size). He told them that the desert giants were nomads known for fighting with paired scimitars, avoiding human settlements, and vigorous defending their privacy. He offered them a good price for the blades, confident that he could find a buyer despite the condition of the broken one. Fatou had heard that Burburan had no temple, per se, but that some priests of Jorilin served the faithful here. Fatou explained to her companions that Jorilin was the shadowy trickster god of the Javanian Pantheon, but unlike the void god Asmolon, was openly worshiped alongside His/Her parents, the sun and moon. Lucretia accompanied her, and the two women found the priests working as moneychangers in the marketplace. The two priests, a male human and a halfling of indeterminable gender, wore gray robes with black hoods that identified them as priests. Fatou's religious training made it easy for her to strike up a rapport with the holy folk. When she produced the disk and told how they had found it, the smaller priest took them into the tent behind the booth for privacy. The halfling confirmed that it was Medan, but could not read the script. 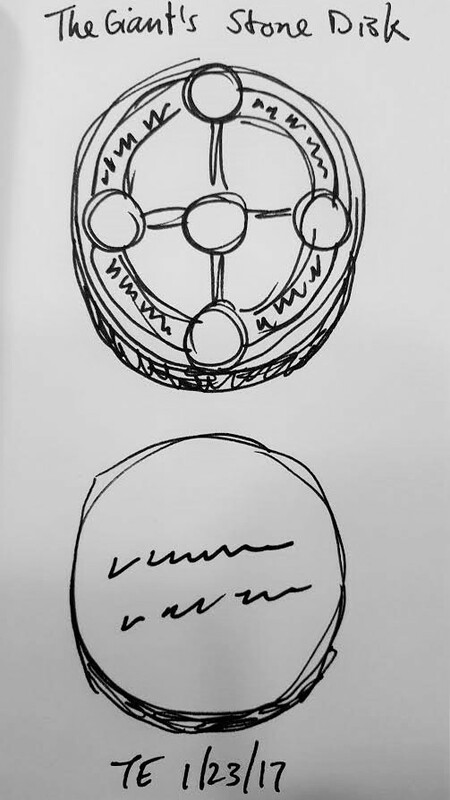 The priest had seen this version of the symbol in connection with the ruined city of Tibul in the desert to the west, but knew little about the site other than it predated humans and halflings arriving in the region. Meanwhile, Jumari and ZhaZha visiting the watering hole to see if the Diggers had returned. They had not, but the proprietor agreed to pass on Jumari's message that they seek someone who knows the Giant language, and where their caravan is staying. The two half-orcs waited there a while longer, having arranged with their friends to meet here after all their errands were complete. Put on his boot and found a scorpion there. Eating the dead, a huge carrion bird. To battle and knocked it out of the sky. And found giants, some one-eyed, breathed their last. We met with a local of much renown. "Hey, look, a Dungeons and Dragons ride!"